The following is an interview with me published in the April 2018 issue of ON Magazine. On Magazine author is Carrie Temple. When the school year ends, learning doesn’t have to stop. Kidventure camps provide wild untamed fun and free-range educa- tion, allowing kids to truly reconnect with nature and learn a thing or two about themselves. We sat down with Mike McDonell, president of Kidventure, to explore the varied benefits of summer camp. 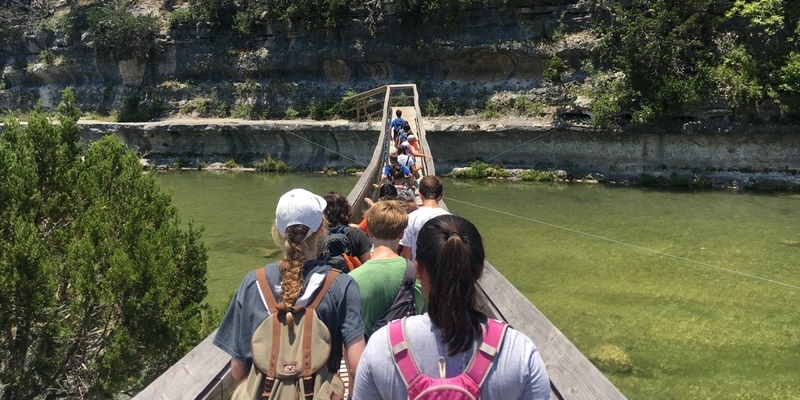 ON: With the increased proliferation of technology in everyday life—how does camp get kids to disconnect from social media and connect with nature and each other? What social changes do you see over the course of a camp session? MM: Camp has a unique way of bringing our kids back to what matters most – people. Our kids are presented with so much information though a number of outlets. That information and its dissemination is tough for anyone to work through, much less a ten-year old. While technology certainly makes our lives easier and more efficient, it’s no replacement for human contact and interaction. Camp brings us together, it fosters positive relationships, communication, and interaction. It reminds us that the best kind of friend in life is the one ‘off-line’. The average 8-10 year old spends 8 hours behind a screen during the week (more for older kids). That same kid only spends 4 hours of free play outside. At Kidventure we recognize that being outdoors, playing and moving your body can not be underestimated for its place in natural growth and maturation. Playing encourages risk taking, independent decision-making, cooperation, trust, and problem solving. These are the traits and skills that will allow our kids to grow happy, successful, and strong. When we schedule camp activities that are designed to foster these skills, then we see the results. Those results are a greater sense of self-esteem, a greater sense of confidence, the ability to deal with failure and a love for an active lifestyle. ON: Away from the watchful eye and helicopter tendencies of some parents, how do campers gain independence and confidence? MM: In the quest to ‘protect’ our children from the potential harms of life, many parents end up handicapping their kids and preventing them from flourishing to become confident and independent people. If we want to grow happy, healthy adults, then we must first provide the opportunity for our kids to be happy and healthy kids. That means giving them the opportunities to try new things, explore their world, make independent decisions, and fail as well as succeed. Too many parents have essentially ‘bubble-wrapped’ their kids and constructed an environment where their kids simply will not grow like they should. We have a society that over schedules their kids in organized sports and activities but won’t let their kids go outside and simply play on their own terms. The need for kids to explore their world with no direction from a parent is as vital as water to grass. Without the opportunity for a child to lead that play in some form is really preventing our kids from reaching their potential. ON: With more camps popping up that take a formal approach to learning like STEM based camps, what is your argument for choosing a more ‘free-range’ camp experience? Out of a traditional classroom setting, what are kids learning at Kidventure? MM: We have the opportunity to raise two types of kids. One will have a high degree of cognitive prowess and technological abilities. They will be very skilled at coding, the sciences, and mathematics. The other will have the same abilities but will also possess a set of skills that will value working with others, will be able to lead others through effective communication, will have a confident spirit, and will see the artistic side of life. In other words, the ‘leaders’ of tomorrow will have experienced nature and the outdoors. They will have played with others on their terms, they will have climbed a mountain, kayaked a river, and hiked a canyon. They will have failed and succeeded and learned from both. They will have gone to camp. ON: It’s inarguable that unstructured time outdoors is extremely beneficial to kids. After camp and summer have ended, what can parents and kids do to keep reaping these benefits? Go hike, go garden, whatever. Just go out and do it on their terms. Ask your kid to plan a day outdoors. Make a fort with sheets and books, cook in the kitchen together, make slime. We can’t always be outside, but the same spirit for exploration and creativity should permeate inside the walls of your home. You can’t accomplish 1 and 2 by sitting behind the screen. Turn it off, regulate its usage and value your time with our kids more than the screens. At Kidventure, we hand out the red ‘carnival tickets’ to kids all the time at camp for random acts of kindness, being respectful, helping others, etc… In other words, we are building up the positives and encouraging others to do the same. Do this at home. As parents, we tend to gravitate toward letting our kids know when they did something wrong and not when they do something right. The greatest lessons in life we learn are the ones when we fail. If you never let your kid fail, then how will they cope when they grow up. Let your kid try new things all the time. If they fail, which they will, then guide then through an appropriate response. Failing is part of life. In fact, it’s one of our greatest tools. ON: How does camp build character? What is the biggest transformation that you see in campers? MM: Camp doesn’t build character. People build character. Camp just provides a very positive, safe and comfortable setting with which to do so. That begins and ends with the quality of the camp staff. How they demonstrate character to the campers will dictate the culture of camp and how those kids follow. It is probably the biggest piece of what we do at Kidventure. All the games, sports, events and stuff we do at camp is great, but it’s all designed to create an opportunity for a kid to become more confident, kind, empathetic, caring, and happy. Good ‘character’ people were good ‘character’ kids. We learn to have good character when we are young because of those around us. Kidventure is a garden for character. ON: It’s a heavy time to be kid-school shootings, the opioid crisis, and increased peer pressure are affecting youth more than ever. Do you find that more kids come to camp fearful? How can camp restore hope and optimism? MM: Great question. I do believe it is a difficult time to be a kid. Yes, lots of crisis and stress takes place on a regular basis. But now, kids are aware of it so much more because they have a screen in their face most of the day. This causes more stress and anxiety in adults. Imagine what it doing to our kids. The only way to restore that hope and optimism is through humanity. Creating strong positive relationships at camp provides the strength and confidence to wrestle with all of this fear and uncertainty. Camp (when done right) provides a well to draw from, where children and adults come together to share a love for play, for happiness, for teamwork, for hope, for diversity, and life. For us, there is no better place to experience the human spirit than camp.